Sunday night a thick fog descended on Liverpool. By Monday lunchtime it had lifted but I was still able to get some interesting photographs down on the waterfront at Lunchtime. I was surprised how many people were out with their cameras. Normally if I wander down there at lunch time there will be tourists about. There were a few Japanese tourists and a couple of school parties braving the December cold. There must have been a dozen or more locals out looking to get an iconic shot of the foggy waterfront. 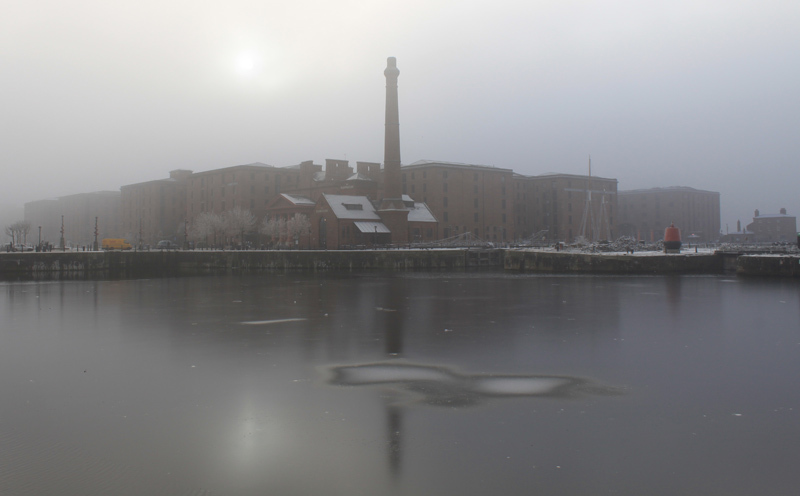 Here’s a wide angle shot of the Albert Dock from Strand Street. I’m hoping for a chance to get some shots in heavier fog sometime.